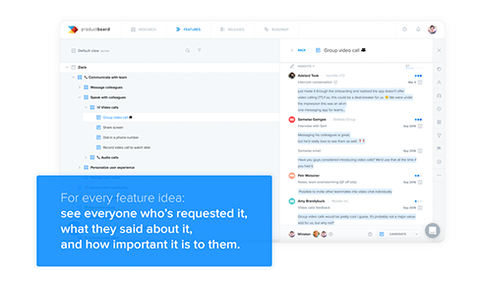 productboard is an all-in-one tool for product management that helps teams understand what their users need, prioritize what to build, and earn buy-in for their roadmaps. Once you’ve decided what to build in productboard, push features into Pivotal Tracker to see them through the delivery process. You’ll even get automatic status updates in productboard as your developers make progress. With productboard for prioritization and Pivotal Tracker for project management, you’ll have all you need to ship truly excellent products. If you’re a productboard admin, set up the integration in project settings. Indicate whether productboard features should become stories or epics in Pivotal Tracker. On your Features/Releases boards, use the special Pivotal Tracker Task column to push features and track their status right from within productboard. productboard is the product management tool of choice at companies like Avast, Sprout Social, and Envoy. Its mission is to help product teams across the globe make products that truly matter to end users. Follow productboard on Medium for discussions on product management tips, trends, and best practices.